In TOXIC PEOPLE- FAMILY MEMBERS TECHNIQUE TO DEAL WITH THEM – PARENTS, CHILDREN SIBLINGS, SPOUSES, AND LOVED ONES, part of Dr. Glass’ TOXIC PEOPLE ® Audiotape series, Dr. Glass helps you identify and deal with those family members who may be toxic to you, people with whom you may be forced to interact .Read by Dr. Lillian Glass, world renown communication expert, Dr. Glass is the is the original author of the best-selling book since 1995 Toxic People. Through the popularity of this book she coined the phrase “toxic people” used in today’s vernacular. In TOXIC PEOPLE® – FAMILY MEMBERS TECHNIQUE TO DEAL WITH THEM – PARENTS, CHILDREN SIBLINGS, SPOUSES, AND LOVED ONES , part of Dr. Glass’ TOXIC PEOPLE ® Audiotape series, Dr. Glass helps you identify and deal with those family members who may be toxic to you, people with whom you may be forced to interact .Read by Dr. Lillian Glass, world renown communication expert, Dr. Glass is the is the original author of the best-selling book since 1995 Toxic People. Through the popularity of this book she coined the phrase “toxic people” used in today’s vernacular. There are family members who make your life miserable…and who’s toxicity can effect and even destroy your life, causing you emotional and physical distress. 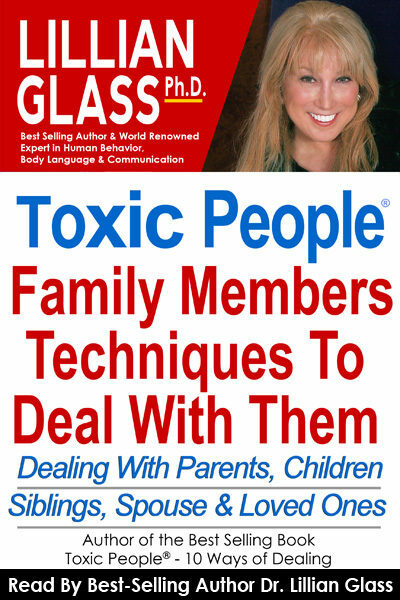 Not only does Dr. Glass help you identify these specific group of Toxic People in the Workplace, she also provides proven techniques for successfully dealing with those in your family.